Bloodhound SSC To Outpace Superman | OhGizmo! By Evan Ackerman on 10/24/08 • Leave a comment! In humankind’s never ending quest to be just a little bit more badass than the previous generation, the Brits have taken it up a notch and are building the world’s fastest car, designed to be a good bit faster than a speeding bullet with a top speed of 1,050 mph. That works out to be about 1.4 times faster than the speed of sound. The Bloodhound SSC (super sonic car) consists of a seat and some wheels strapped to a V12 race engine strapped to a jet engine (pilfered from a Eurofighter Typhoon) strapped to a rocket, all integrated into a carbon fiber and titanium body. This is not going to be the first car to break the sound barrier. 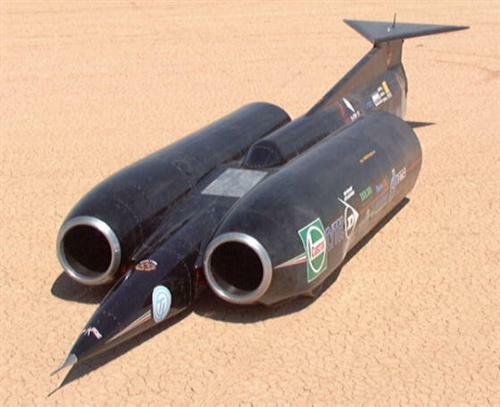 That honor goes to ThrustSSC, a car powered by two jet engines and build by the same team who are now building Bloodhound SSC. Even if ThrustSSC is a bit of a granny car compared to what Bloodhound is supposed to be capable of, I think it still takes the prize for fastest looking. Pics and vid of it, after the jump.